Long before the Spaniards arrived in Florida, Alachua County's unique combination of fertile soil, broad prairies, clear lakes and abundant game had spawned a complex Indian Civilization called Timucuan. Throughout the sixteenth century Spanish explorers like DeSoto plundered the region, then Franciscan priests founded missions and finally ranchers established a large cattle ranch on Payne's Prairie. During the early 1700s the English and their Indian allies destroyed these missions and later the Seminole Indians made settlements around Micanopy. Spain had a difficult time controlling the vast territory of Florida, and, unable to stop the influx of American settlers, finally ceded the area to the United States in 1821. Originally part of the Arredondo Grant, Alachua County was created in 1824 as a massive county, extending from the Georgia border to Tampa Bay. Constant partitioning and the Second Seminole War slowed the County's development, but the coming of the Florida Railroad opened up the interior for both settlement and trading. By 1860, Alachua County had over 8000 inhabitants, while Gainesville, its main city, had some 232 residents. During the Civil War, Gainesville served as a major Confederate Commissary and was the site of two battles. Reconstruction brought martial law, Republican rule, the immigration of freed slaves, and an economic prosperity. Two main schools were established, the Union Academy for African Americans, and the East Florida Seminary for whites. By the end of Reconstruction, Alachua County had a population of over 18,000, while Gainesville with 1400 residents was a mercantile center for cotton and vegetable crops. During the next twenty-five years the County continued to prosper as the citrus and phosphate industries gave Alachua a secure economic base. After two major fires in the 1880s, Gainesville rebuilt with all brick structures and constructed an imposing new red brick courthouse to signalize its growth from town to city. Gainesville's central location brought two more railroad connections, and with a population approaching 3000, the City was one of the state's largest. The town now had an opera house, paved streets, city water, telephones and electric lights. East Florida Seminary expanded, becoming a military school, and a new public school was erected. Merchants like Dutton, Miller, and Baird built fine new homes near the downtown area to create fashionable districts in the southeast and along (what is now) University Avenue. New towns like Archer, High Springs, Melrose and Hawthorne, spawned by the railroad expansion and the citrus and phosphate boom, welcomed tourists, investors, and speculators. Although severe freezes in the 1890s blighted much of this prosperity, Alachua County entered the Twentieth Century with a population of some 32,000 people, and a growing economy centered in the phosphate, cotton and vegetable industries. The first two decades of the new century brought Alachua County's agricultural based economy troubled times as the boll weevil blighted the cotton crops, and World War I brought an end to the phosphate industry. Still one of the most significant events in the history of the County occurred in 1905 when Gainesville was chosen as the site for the University of Florida. When the University opened a year later it had only 102 students, fifteen faculty and two unfinished buildings. Twenty years later the student body numbered 2000 and attended classes in thirteen Gothic-style buildings including a library, a gymnasium and an auditorium. By the 1930s the University had become the most important staple in the County's economy and helped it weather both the land boom collapse of the mid-1920s and the long depression of the 1930s. During these years before World War II the County's population remained fairly constant at nearly 40,000, but Gainesville's inhabitants soared to almost 14,000, nearly four times its 1900 size. The postwar era brought Alachua County a tremendous population growth and economic expansion. The influx of thousands of veterans seeking an education transformed both the University and Gainesville. The University expanded to over 9000 students, admitted coeds in 1947, built a medical school in the next decades, and by 1970 had a student body of 23,000. By the end of the century the University would enroll 44,000 students, be admitted to the prestigious Association of American Universities, and become one of the major research institutions in the entire south. The County and City also changed dramatically in these postwar years. By 1970 Alachua County had 104,000 inhabitants with three-fourths of them residing in or around the Gainesville city limits. 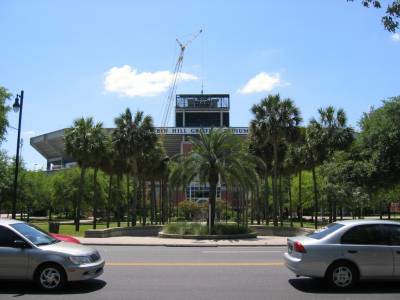 During these years Gainesville's downtown area became a professional and government center as the retail stores and merchants moved to large malls which were constructed in the northwest and southwest areas, especially around I-75. In the 1980s its surrounding neighborhoods like the Duckpond, the Southeast and the Pleasant Street areas all created historic districts and thus preserved their unique residential character and protected their fine Victorian homes. These preservation efforts spurred the City's willingness to sponsor and financially support significant restoration projects like the Thomas Center, the Hippodrome, the Seagle and the American Legion buildings. A new courthouse with an outdoor plaza, a new library and a five-story Union Street Station were built, while older buildings like the Star Garage, the Florida Theater and the Bethel Gas Station were restored. As a fitting climax to these revitalization efforts Money Magazine in 1995 named Gainesville as the most liveable city in America.